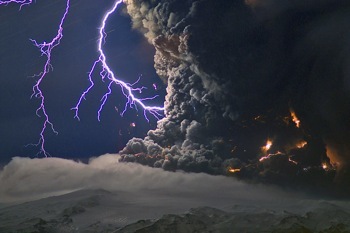 Mother Nature: It’s a Utopia! Have you find Wang Guowei Wasp and solved the mystery of his disappearance? If your mission has not been completed yet, you may find some answers here…Listen carefully: the City is showing you the right path..
RMB City REWARD. Come to RMB City, to look for a missing poet. His name is Wangguowei Wasp. 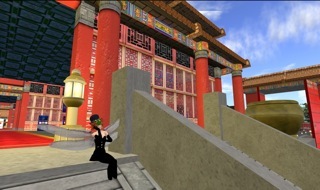 They say it’s the famous poet, Wang Guo Wei, reborn as a Second Life avatar. You may vaguely remember that you have read this poet’s work, that some of the phrases in his poetry could make your heart jump. Because you want to take the responsibility to find this missing life, you have decided to accept this mission. To search for him, please continue in RMB City to find the clues. RMB City REWARD: All of the little hotels have grand names. The China Hotel is no exception. RMB City REWARD: When the hotel owner looks at you with naïve and innocent eyes, you will know that you have found the right place. Usually, in these types of places in the city – a place that people might see in the daylight as decrepit or filthy – usually is a very valuable clue. According to our friend M, the missing poet lived for a long time in these slums. JEROME: I have never met him, but there is good wine here, so maybe he has drunk here. RMB City Reward: Congratulations, you have gotten the right code. Please continue to search in RMB City for the next clue. We heard Master Q is an eager helper and very trustworthy, she lives nearby. It is not strange that in Chinese folklore, the Feng Shui Master always appears on the horizon in desperate times. Master Q: My eyes change from red to blue; my eyes are fire. Water and fire harmonize each other, and in the Second Life, I can see that all sectors of life become broken pieces when passed down generation by generation. These vague and unclear matters repeat themselves; they spread in RMB City like toys, or as if they are lining up to wait for the magical gates to open. RMB City Reward: Congratulations, you have cracked the code accurately. Please continue in RMB City to look for the next clue. Master Q has indirectly shown you the way, the direction of the water. 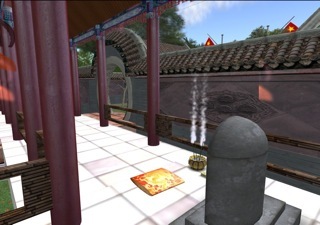 Go to the abundant water network of RMB City to look for it, if you’re lucky, you will find the “Yu Gong”. RMB City REWARD: Congratulations, you have cracked the code accurately. Please continue in RMB City to look for the next clue. This painting scroll is “Gazing at the Mountain on the Riverbank”, by Ni Zan, 1363. It depicts Ni Zan’s feelings as he says goodbye to his friends, taking his boat onto the river and gazing back at the mountain. The saying goes, that in the most difficult times, Ni Zan decided to sell everything he had, take the boat, and sail out onto Tai Lake, initiating his floating hermit life. Being a hermit was Wang Guo Wei’s dream in the first life, could it also be that he’s become a hermit in RMB City? 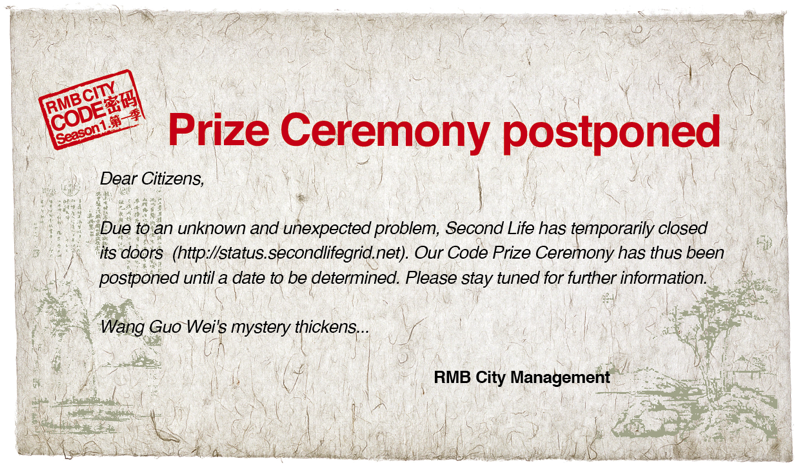 RMB City Reward: Sorry, your search took a wrong turn. Time in RMB City is ‘condensed’, therefore you have to grab at the cracks in time, so that you may encounter people from different lifetimes. All of these people have a possible connection to the poet. RMB YuGong – Congratulations, you have found the LANDMARK, continue to follow the stream to look for the next clue. 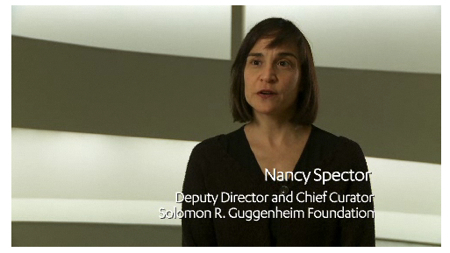 China Tracy: Sorry, I can’t tell you more, because this Second Life has no memory. This city continues to stretch, there is no end. Everything flows far, far away…. RMB Depression Bottle: No water here, only the image of the water. RMB Happy Bottle: RMB City is created with transparency and imagination. It is very possible it doesn’t exist, and even though it exists now, it might not exist in the future. It ends after our visit ends, it starts again upon our return. Repeatedly it goes in and out of life, in the end, we all share the whole world. RMB City Reward: Congratulations, you’ve gained the “People’s Card of Health”. Please continue to look for the next clue, as the massage beauty has left a word for you: In this city, people come and go, and it’s hard to find the ideal husband! RMB City: Perhapa WangguoweiWasp comes to this ‘pleasure parlor’ just to feel the sadness of happiness in a swift exchange. RMB City Reward: This poem, titled “Water Dragon Song”, was composed in Wang Guo Wei’s first life, around 1907. RMB City REWARD: To compose poetry on the wall is a form of expression that Chinese literati will never tire of. RMB City REWARD: In this poem, on one hand, the poetry’s emphasis is on the “imagery of the water”, the misty rain on the pond, spring stream and the tears of the departing people. On the other hand, in this phrase, he also hinted at the “earth” and its relationship with water, (alike they drift, but its preferable to be stable earth, rather than to be loose, flowing, moving water) – starting with the body of water, extending to its opposition to the earth, all while hinting that we will ultimately turn toward dust. 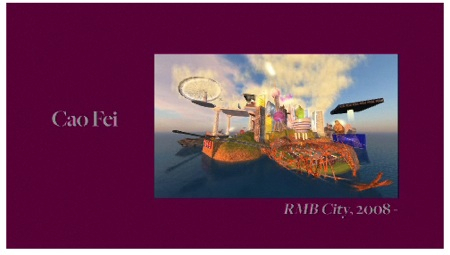 RMB City REWARD: Sorry, your mission has misidentified the matter, please continue to search in RMB City. RMB City REWARD: Sorry, you have misidentified the matter, There is a poem that will give you direction. RMB City REWARD: Congratulations, you have received LM, this city is full of the life of Avatars, because people gather air gradually, then maybe as this city gradually gathers more temperature, it will have more of a human atmosphere. RMB City REWARD: Is it that the poet sits by the only dining table, facing the empty chair and the beautiful dishes, but with no one to toast? 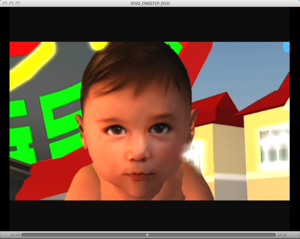 Marx: I found real happiness in Second Life, the realization of the happiness of personal value and labor. 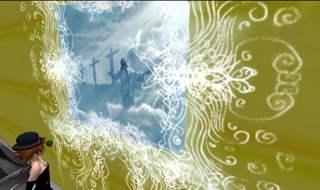 I always believe: the New World will be reborn constantly, just as the Old WOrld will die constantly. Red Detachment of Women: In my Second Life, I find my most worship-worthy revolutionary companion. Marx: I’m sorry, your mission has misidentified the matter. For instance, if I say that Wang Guo Wei’s first life was in the era of revolution, and suicide was his inevitable destiny, then the confused poet Wangguowei Wasp is exactly the sort of “post-revolution anxiety” of this romantic city. Marx: The whole city is filled with those extraordinary “post-revolution anxieties” – it is an indescribable contemporary daily atmosphere – where have the revolutionary heroes gone? RMB Psalm: Sorry, your mission has misidentified the matter. 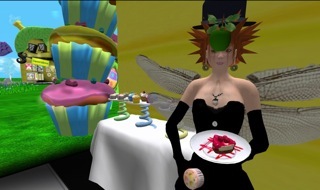 In Second Life, the revolutionaries still long for revolution, the depressed people are still sunk in despair. The memorial still exists, but the ghost of the memory has died. RMB Psalm: In these young ruins, are there undying lovers in the broken airplane, flying the red flag, rusting public squares, broken streets, singing his poems? If you bring those poems amongst the mountains, water, grass, and trees, maybe you will find the spirit of the poet. RMB City Reward: Congratulations you have found Wang Guo Wei ‘s Hat, please wait for the date of award ceremony. 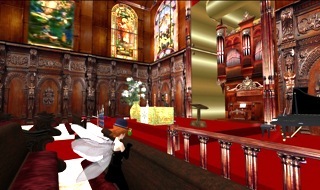 In Second Life, life and death blur together, we have the opportunity to experience everything. RMB City REWARD: Congratulations you have found Wang Guo Wei’s calligraphy brush. Please wait for the date of the awards ceremony. Whether it is in the first or second life, we hope to find a stable life and an established destiny. 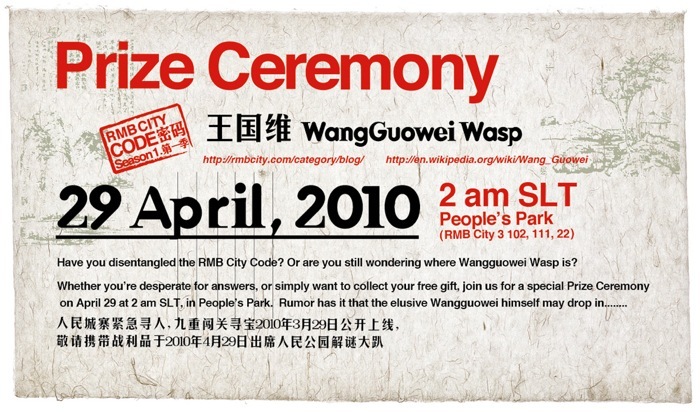 RMB City REWARD: Congratulations, you have found the ghost spirit of Wang Guowei Wasp, please wait for the date of the award ceremony. The low singing of the poet floats through the ears: “Standing by the rail, mountain and river do not end, it is easy to depart, but harder to reunite. Running water, dropping flower petals, spring has gone, heaven is on earth. then how would wither after rain. just there, all for the wind. all branches all been covered by whitish snow. sadness and happiness in the world are all fall into pieces. rather to gather into dust, not flow away by the river. are stored the tears from whom already leave. “For this reason Christ died and came back to life so that he would be the Lord of both the living and the dead”; with his ‘teleporting’ power he set foot on the vast emperor of Catai and celebrated the Qing Ming Jie with his oriental friends. They raised the glass to his miraculously rosy complexion and to all their beloved ancestors, brought food and money to their tombs, and being ‘deadly’ hungry, decided to cook a huge lamb for themselves. 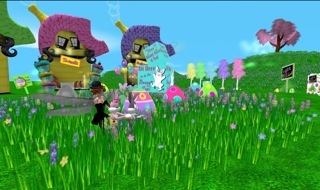 They drank the new tea and colored boiled eggs as homage to the beginning of spring and the rebirth to a new SecondLife. HAPPY EASTER AND HAPPY TOMB SWEEPING DAY!